Many consumers shopping for retail products start their journey online, and usually with a search. Although retail marketers know that online shopping often ends with either an online purchase or an in-store visit and sale, many paths to purchase in retail also involve a consumer calling a store location or contact center. To acquire more customers, retail marketers are optimizing their digital ads to drive more high-quality calls and personalizing the caller experience to increase call conversions. 1. 81% of retail shoppers conduct online research before buying. The overwhelming majority of retail consumers start their journey with online research (source: GE Capital Retail Bank). 2. 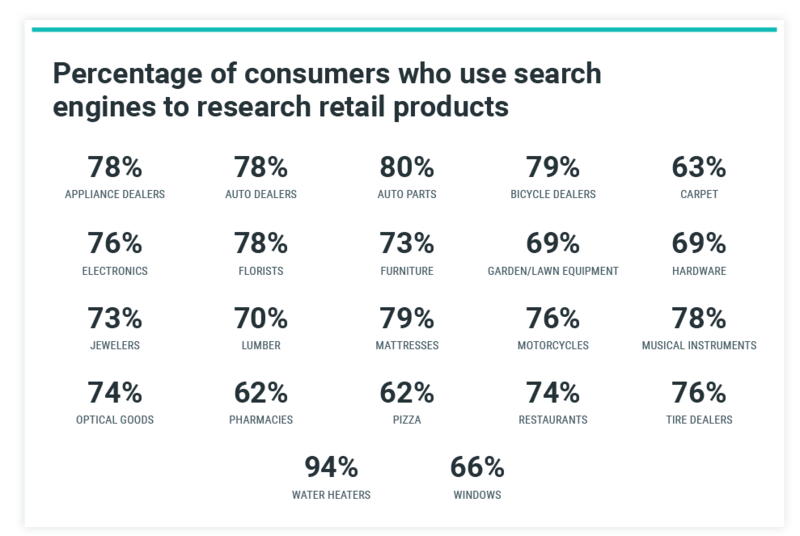 Consumers researching water heaters, auto parts, bicycles, and mattresses are the most likely to research products via search engine. In almost all retail verticals, the majority of shoppers start the research process with a search engine query (source: LSA). 3. 77% of shoppers use a mobile device to search for products. The majority of these searches occur on mobile devices, since retail shoppers frequently research competitor products and pricing in-store (source: Salsify). 4. In 2018, US retailers spent $23.5 billion on digital ads. This is an 18.7% increase in spend from 2017 (source: Mobile Marketer). 5. The average cost for a retail lead is $34. With ad spend on the rise, retail marketers are paying more for each lead (source: Integrated Marketing Association). 6. The average conversion rate for a retail lead is 3%. Despite paying more for leads, retailers are often failing to convert them to customers (source: Marketing Insights). 7. Consumers running mobile searches are 39% more likely to call a business. Since the majority of shoppers run search engine queries on mobile devices, this represents a huge quantity of calls to retailers (source: Google). 8. $119 is the mean price point at which retail customers are likely to call. Consumers usually call when shopping for more expensive retail goods, since these are considered purchases and often require a conversation with a live agent to clear up questions (source: Google). 9. 37% of retail shoppers call directly from paid search ad call extensions. Call extensions are an effective tool for retailers to drive more calls to their locations or contact centers (source: Google). 10. 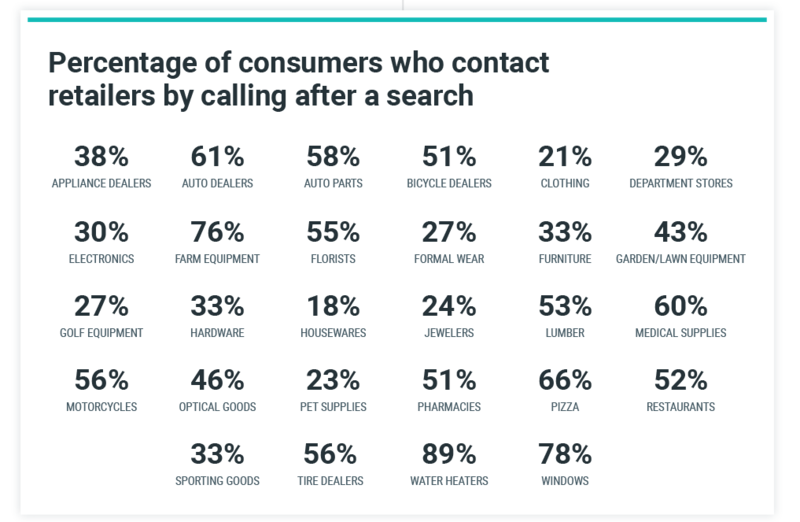 Consumers researching water heaters, windows, and farm equipment are the most likely to call retailers after performing a search. In many retail verticals, consumers transition directly from online searches to phone calls (Source: LSA). 11. Calls will influence $1 trillion in US consumer spending this year. In our mobile-first world, calls are often the most convenient way for customers to convert (Source: BIA/Kelsey). 12. Phone calls convert to 10-15x more revenue than web leads. Calls are the most valuable conversions retail marketers can drive. By tracking the calls driven by your retail ads, you can measure your full ROI and optimize accordingly (Source: BIA/Kelsey). 13. Callers convert 30% faster than web leads. Calls provide a more immediate return on your marketing investment (Source: Forrester). 14. Caller retention rate is 28% higher than web lead retention rate. Driving calls from retail marketing campaigns is also more profitable in the long-term — callers are more loyal than web leads (Source: Forrester). 15. 80% of customers say the experience a company provides is as important as its products and services. Expectations for the customer experience have never been higher — to acquire new customers, retailers need to meet them. This includes calls (source: Salesforce). 16. 65% of consumers have cut ties with a brand over a single poor customer service experience. If you fail to provide frictionless caller experiences, it will cost you customers (source: Digiday). 17. 32% of consumers say phone calls are the most frustrating customer service channel. Simply fielding inbound phone calls isn’t enough — it’s important to have data on each caller so you can quickly and efficiently address their needs (source: Aspect). 18. 84% of consumers believe retailers should be doing more to integrate their online and offline channels. To address this concern, retail marketers are using call attribution and analytics to personalize the caller experience (source: RetailNext). So What Can Retail Marketers Do to Drive More Call Conversions? Make it easy for shoppers to call you. This includes using call extensions on Google shopping ads, making “call now” an action on web pages, and including a call option on online shopping carts. Capture the common questions callers are asking on calls and address them in your online content to boost conversions. To learn more retail marketing best practices, download our ebook — The Secret to Retail Marketing ROI: Inbound Calls.